I have started commuting recently to work and university with my bike. It's not ideal, but as it is, I'm not willing to invest in a new one, hence why I'm looking for suggestions to improve my current one. Weight is around 20-22kgs. The wheels are Schwalbe Big Betty Performance Line 26" x 2.40" on the front, Kenda Kinetics 26 x 2.35 on the rear. On my way to work and uni I'm mainly on roads but do encounter some cobbled roads and uneven terrain. 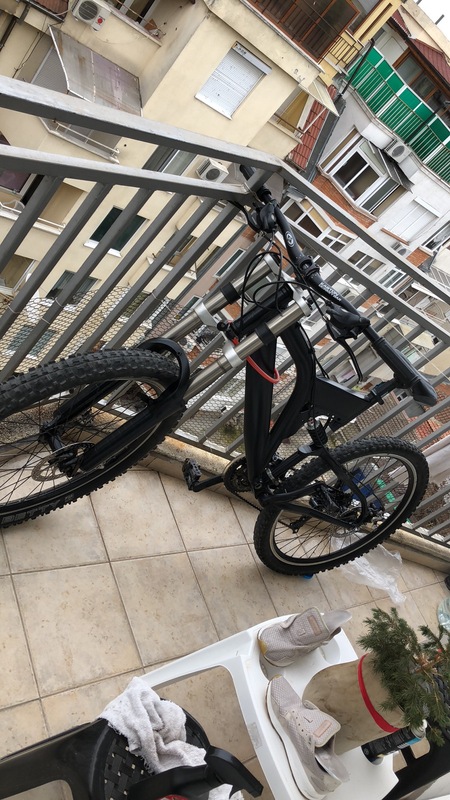 I previously used the bike on downhill trails. As of right now, I'm averaging around 8-9MPH or 15KM/H. I'd love to get that up to 20KM/H. You really can’t change it that much. A dual-suspension downhill mtb will always have limitations, most notably its weight, wheel size and width, and geometry. Instead, get a used, 1970s, steel, road bike for your commute. It should cost you roughly $50-150 euros or dollars. You’ll be amazed at how light a road bike (even a steel antique) will feel compared to a mountain bike. My 1975 Peugeot MX-18 weighs just under 11kg (I did swap the steel rims for alu ones). This is half the weight of your mountain bike! A road bike, even an old one, will be faster over paved surfaces and learning how to “float” over cobblestones and rough surfaces will help your mountain biking skills. Finally, since a used beater is so cheap, you won’t worry as much riding it in all weather conditions or about bike thievery. There is not much you can do to a downhill bike for better commuting beyond swapping out tires for narrower on-road ones. Weight and bouncy suspension are an intrinsic part of the bike. To go faster you will have to get fitter and stronger. Lock the suspension if you can. Every time you press the pedal, some of your energy is lost to bob as the suspension soaks it up. A fully rigid bike will not bob. If your suspension has no lockout functions, consider adjusting the controls till its harder with less sag and less rebound. But I totally second the suggestion of get a cheap second hand uni bike. When I was at Uni the odds of keeping a bike like yours for 1 year were the lesser of zero and nil. Save yourself time and worry, and just give it to a homeless guy now. He needs it more than the bike stealing scum at Uni. If you have trains, or friends with cars consider a folding bike. They are really convenient for optimising your travel by hitching a ride then cycling off. You don't need a 'designer' bike. Pick up a cheap or second-hand road model. It also might not attract thieves so much, though I'm afraid here in London they'll steal anything that isn't chained down, and plenty that is. If you want to experiment to see how much energy is lost by the your profiled tires, try a pair of slick tires; there are some that look almost like the profile-less ones for road bikes, just wider so they fit your MTB rims. Obviously, they are a bit more sensitive to nails, glass etc., so do drive carefully with them, keep a flat repair set with you, just in case, and of course don't throw away your old tires. If you do think that these help you a lot, either stick with them, or (if flats are a problem), find some semi-slicks. Locking out the suspension is something you probably did already. Aside from that, having been in your shoes, I didn't find too much to do. You'll get more fit over time. Try to ... well ... pedal faster, try to find your sweet spot regarding cadence. Try to pedal intelligently with respect to forced stops (red lights) - try to approach them slowly so you are already in motion when they turn green, shaving off a few seconds of acceleration each time. If your ride has straight open segments where there is no danger from pedestrians, then consider getting more aero. move your hands on the handlebars closer to the stem. You'll want to be in a high gear already. lower your head and shoulders down toward the bar to decrease your overall frontal size. Downside of doing this is your hands are a long way from your brakes, so you need extra reaction time if its turning bad. Don't do this in traffic or anywhere with a lot of people/kids/animals. for your and their safety. You can get semi-slick tires that have less rolling resistance. The back tire has more weight on it, so to start with you might only swap out the rear if you're on a budget. Swapping the rims so you can use narrower tires might be even better, but on my (no suspension) MTB that I use for commuting, I kept the original rims and just use mountain-bike tires that are intended for riding on hard granite trails. The middle part of the tread is basically pebbled, not studded, so they roll nicely on flat roads. 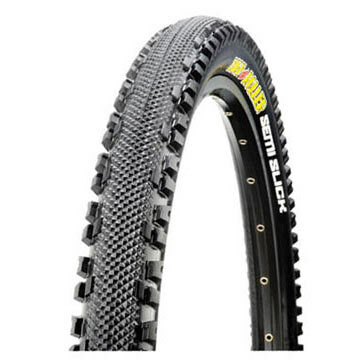 See Choosing good slick tires for a MTB for recommendations on this site. Depending on how much / what kind of off road you still want to do on your bike, choose accordingly. Increase the pressure in your tires (this was mentioned in comments). This will make it less comfortable, but will decrease rolling resistance. Also, try to optimize your route from a commuter's point of view: use smooth roads where possible. And if there are significant changes in height on your route, try to optimize them too. Not the answer you're looking for? Browse other questions tagged mountain-bike tire wheels commuter commuting-bike or ask your own question.